In an attempt to restrain the generation of black money in domestic market, the Lok Sabha has approved the Benami transactions Prohibition (Amendment) Bill. 1. It empowers the Government to confiscate Benami properties held in the name of another person or under a fictitious name to avoid taxation and conceal wealth. 2. The person found guilty of Benami transaction may have to face rigorous imprisonment for a period not less than one year and which may be extended to seven years. In addition to imprisonment, there would be a penalty of 25 percent which will be calculated on the basis of fair market value of the property. b. Where the person in whose name the property is held is a trustee or other person standing in a fiduciary capacity, and the property is held for the benefit of another person for whom he is a trustee or towards whom he stands in such capacity. 5. 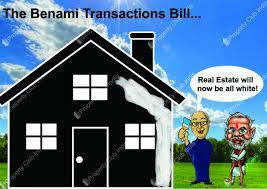 It proposes proper Appellate mechanism to deal with Benami transaction. 6. It specifies the procedure to be followed by the authority for imposing penalty in Benami transaction. It also clarifies that any benami transaction on or after the date of commencement of the Benami transaction (Prohibition) Amendment Act, 2016 shall be punishable in accordance with provision laid down by the act. 7.Adjudicating authorities and appellate tribunal appointed under the Money Laundering act, 2002 may discharge the functions until the adjudicating authority are appointed and appellate tribunal is established under the benami act.